Michael McFadyen's Scuba Diving - Tui Tuate During both the First and Second World Wars, the Governments of Great Britain and United States built huge numbers of ships to support the war effort. These vessels ranged from small patrol boats to large freighters. 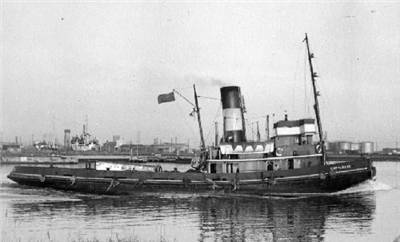 During World War II, Britain designed and built a class of tug that were called the "Empire" class. These small ships were approximately 105 feet long, 27 feet wide and displacing 232 tons. In 1945 one called Empire Shirley was launched from the A. Hall and Company Limited shipyard in Aberdeen, Scotland. I am not yet 100% sure of the engine, but a sistership, Empire Pine (see the attached photo) had a triple expansion steam engine built by Plenty & Son of Newbury (England?) with a single boiler. An identical vessel was the Empire Pat which later became the Himma. This ship is scuttled off Long Reef in Sydney, Australia. The new ship was owned by the Ministry of War Transport and was sent to do Naval support work in the India to Singapore area. After the war, the ship was sold to the Union Steamship Company of New Zealand (owner of the SS Tekapo wrecked in Sydney). The ship was renamed Tapuhi and from 1947 to 1973 the vessel worked the ports of NZ. One other reference states that she was sold to BP in New Zealand after the war but I have yet to confirm this fact. On April 10 1968, the New Zealand inter-island ferry TEV Wahine was on a regular trip from Picton on the South Island to Wellington on the North Island with 600 passengers and 125 crew aboard. Just after 6 am the ship was hit by two huge waves and driven ashore at the entrance to Wellington Harbour. The ship was later driven off the reef and was taking on water, but the pumps were keeping the prospect of sinking temporily at bay. She was now drifting northwards into the Harbour. Shortly after 11am the tug Tapuhi arrived on the scene and managed to get a line to the ship. She began towing the Wahine from the stern but after 10 minutes the line broke. Attempts to reattach it failed. The Wahine had a list to starboard. At 1.15 pm the order to abandon ship was given and soon after the Wahine turned over and sank. A total of 51 passengers and crew died. The Tapuhi rescued 174 people from the sinking ship. Today there is a memorial to the Tapuhi at Oriental Bay in Wellington. In 1973 she was sold to Narain Shipping Company of Suva, Fiji. She was renamed Tui Tawate. The next year, Reece Discombe (or Discomb as one reference calls him) purchased the ship. He renamed her Tui Tuate. This appears to indicate that Reece was at that time based in Suva but since he advised Barry May in 1968 or 1969 about the location of the SS President Coolidge in Santo, Vanuatu, he may have been living in Vanuatu. Reece has lived in Port Vila, Vanuatu for a long time till he died in the late 2000s. By the early 1970s the salvage work on the SS President Coolidge in Segond Channel, Espiritu Santo, Vanuatu, had turned to the oil contained in the ship's huge bunkers. By now oil was leaking from the hull, especially where the salvage work had cracked the hull. Ian Lockley from Fiji purchased the salvage rights to the Coolidge from Barry May in 1972. An interesting aside is that Lockley was also involved in the 1986 salvage of parts of the MV Mikhail Lemontov in New Zealand, a ship that sank near where the Wahine ran on her normal run. After many complaints from residents living alongside Segond Channel, the Government asked Lockley's company, Salvage Pacific (Fiji), to quote on removing the oil. The initial job was to survey how much oil was left in the ship. Mr Lockley designed a small recompression chamber and it was built in Suva, Fiji. In 1974 it was taken to Santo and anchored to the hull. A shark cage was also constructed (what for? - there are very few sharks seen on the wreck) and placed on the hull near "Euart's Door". The cage can still be seen there today. Allan Power was hired to work on the survey. The aim was to drill holes in the hull from the highest levels till no oil was encountered. This showed the amount of oil left in each tank. Starting in October 1974, it took over six weeks to do the survey. While most of the work was done on the outside of the hull, a considerable amount of difficult work inside the wreck was required. In the end, the survey showed that there were 34 tanks containing an estimated 650 tons of bunker oil. The plugs inserted into the drill holes were now corroding away, letting oil escape. It is also suggested that some wooden plugs were removed by Lockley to enable oil to leak to scare the Government into action. In May 1976 a diver, Mr Martin, placed bronze plugs into the holes and sealed them with concrete. Finally, in 1977, the Government contracted Salvage Pacific to remove the oil and the British Government provided $60,000 for the work. The team drilled large holes into the tanks and placed a valve into each hole. At this stage, no real thought had been given as to what to do with the oil once it was removed. Suggestions were made, including putting it in some underground tanks the Americans had built during the war. However, someone suggested sending a sample to Shell in Sydney to be tested and it turned out that the oil was in very good condition, even though it had been underwater for 35 years. Ian Lockley had an idea for disposing of the oil. To do it, he acquired an old tug from Fiji. This was the Tui Tuate. Some sources state that the tug was owned by Lockley but other sources state that Reece Discombe owned it. Perhaps Reece owned it and Lockley leased it from him. Anyway, it appears that the tug only just made it to Santo where it was converted to hold oil in all its compartments, including crew quarters. It was originally proposed that the oil be burnt in the boilers of the tug and but a better idea had come up. It appears that someone had suggested that the oil be used by the cruise vessel, SS Arcadia. The Arcadia regularly visited Santo on her cruises from Sydney. The oil could easily be used by this old ship so the Government arranged for P & O, the owners of the Arcadia, to purchase the oil. The oil was pumped into the Tui Tuate and from there into the Arcadia. Over three visits in 1977 the ship took on board 200 tons of oil at a time and used it in her furnaces. In the end, the cost of the project was $92,000. P & O had paid $17,000 for the oil so the Government had paid $75,000 less the $60,000 the British Government had provided. After the oil salvage, Ian Lockley stayed on in Santo to do more salvage on the Coolidge. They cut a huge hole on the starboard side above the engine room. This gave access to the huge electric motors and generators, which, off course, contained huge amounts of copper. The condensers were also removed. This work was not proving profitable as much machinery and other items had to be removed to get to the valuable metals. This was the last salvage work done on the wreck. He may have used the Tui Tuate for this work as well. In 1986 Clement Griffiths of Wellington, NZ purchased the Tui Tuate. It is reported that he was going to use it as a floating restaurant back in Wellington. However, it is said that it was not seaworthy enough to make the trip back south and it ended up abandoned in the river near Luganville. In the mid 90s, the Santo Fisheries Department began an expansion project near the abandoned ship, the company hired for construction requested that the Tui be moved as a condition of their contract. So, the resilient vessel with a remarkable history was towed into the Segond Channel and sunk to rest in the calm waters of the Pacific. With the SS President Coolidge stealing her spotlight, the Tui Tuate was soon forgotten until Kevin Green of Aquamarine decided to go searching for her. Kevin knew only that the Tui was resting in about 45 metres of water so with his depth sounder in tow, he started searching the channel. It was only his second dive in search of the ship when Kevin struck gold. There she was, the Tui Tuate, resting upright and proud as if she were just waiting for visitors to come along. As mentioned, the Tui Tuate ended up sunk in Segond Channel, Espiritu Santo, Vanuatu. She now rests in 44 metres of water straight off the Coral Quays Resort, a few kilometres to the south of he island's only town, Luganville. According to Kevin Green of Aquamarine, fewer than 10 people had dived it till October 1998. During this month, seven of my friends dived on it (I was ill) and reported that it was a good dive. Trevor Jackson, skipper of a Queensland dive liveaboard, wrote in the June 2005 DIVE Log that he had been part of a group that had "rediscovered" the wreck with Kevin Green. As indicated above, this is incorrect as in October 1998 it was dived by eight or nine people. On 14 June 2007 I finally got a chance to dive the Tui. Kevin Green took my wife Kelly and I out to dive it in his private boat. It was fairly easy to find but unfortunately there was a strong tidal current running. There is a mooring on it but the current was pulling it well underwater and we could not see it at all. It was going to be one of the lowest tides of the year and despite our thoughts that low tide would be about 10 am, the tide kept running in well past noon. This made it hard to anchor as the light anchor Kev was using was not heavy enough to drop quickly to the wreck once we sighted her on the depth sounder. Finally we hooked in and I went over the side and pulled myself to the anchor rope (along a rope attached to the line) and then down (Kelly did not dive due to ear problems). However, as I went I felt the anchor come free and sure enough, reaching 38 metres I found that there was just a drag mark in the sand showing in which direction the wreck was located! Back up to the boat and looking, looking. After many more efforts we again hooked in. I again pulled myself down. The current was less by now (it was now after noon) but it was still the strongest current I have dived in for about three or four years. The visibility was excellent, at least 30 metres and I could see that we were lucky, our anchor had hooked into the mooring and was attached to the bouy. Soon I saw the wreck and finally I reached it after a few minutes of hard work. Bugger! My camera will not turn on. It has an annoying habit sometimes at depth (over 40 metres) where the lens when it comes out hits the front port of the housing and then automatically retracts and turns off. All this way and effort and I was not going to get any photos. Normally I turn it on at the surface but due to the current, I had not even thought of it. The current went all the way to the bottom. While I waited for Kev to arrive I looked around the bow area. This wreck is a better version of the SS Himma in Sydney. It is in far better condition, not surprising considering that it has been sunk for less time and it is also in a very protected waterway. The wreck sites facing south-west and is upright. As you swim along the sides you will see entrances into the lower areas. These are fairly tight and seemed to me to be far tighter than the Himma's. The deck is in about 41 metres or so. At the stern there is the prop to examine. It is similar to the prop of the Henry Bolte and Tasman Hauler in Eden, NSW. There is a hatchway on the rear deck that gives access to a small hold. Forward of this there is raised covered area. This is the engine room. I did not go into it as due to the current, we had to limit our bottom time (as we were using about 50% more air than a normal dive to this depth). In front of this is the boiler room. The funnel is missing (not sure if it was on the sand, it is not on the northern side) and you can enter through this hole. The boiler is quite large, bigger I think than the boilers of the SS Undola and SS Annie M. Miller in Sydney. Forward of this is the bridge area and the upper section still exists. This was about all I could examine and I reluctantly ascended, gald to have finally dived the SS Tui Tuate but annoyed that I did not get any photographs. This dive is not for the inexperienced and should only be attempted by very experienced deep divers. It is a lot harder than any dive on the nearby SS President Coolidge.